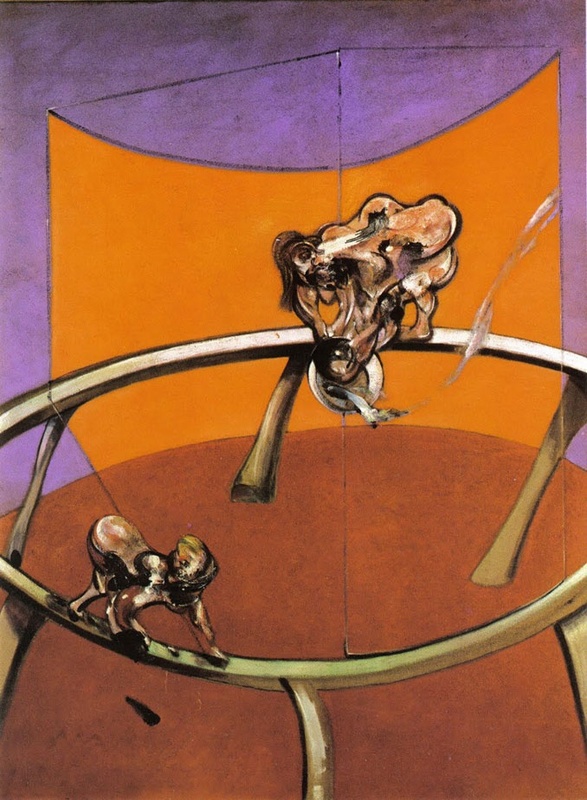 Francis Bacon: Catalogue Raisonné is a landmark publishing event that presents the entire oeuvre of Bacon’s paintings for the first time and includes many previously unpublished works. The impeccably produced five-volume, slipcased publication, containing each of Bacon’s 584 paintings, has been edited by Martin Harrison, FSA, the pre-eminent expert on Bacon’s work, alongside research assistant Dr Rebecca Daniels. An ambitious and painstaking project that has been ten years in the making, this seminal visual document eclipses in scope any previous publication on the artist and will have a profound effect on the perception of his work. Containing around 800 illustrations across 1,538 pages within five cloth-bound hardcover volumes, the three volumes that make up the study of Bacon’s entire painting oeuvre are bookended by two further volumes: the former including an introduction and a chronology, and the latter a catalogue of Bacon’s sketches, an index, and an illustrated bibliography compiled by Krzysztof Cieszkowski. Printed on 170 gsm GardaMatt Ultra stock in Bergamo, Italy at Castelli Bolis, Francis Bacon: Catalogue Raisonné are boxed within a cloth- bound slipcase, and supplied within a bespoke protective shipping carton. Several major exhibitions on Bacon are scheduled for 2016–17. Francis Bacon: Invisible Rooms runs from 18 May until 18 September 2016 at Tate Liverpool, and from 7 October 2016 until 8 January 2017 at Staatsgalerie, Stuttgart. Martin Harrison is the curator of Francis Bacon, Monaco et la culture française which runs at Grimaldi Forum, Monaco from 2 July 2016 until 4 September 2016 and Francis Bacon: From Picasso to Velázquez which runs at Guggenheim Museum, Bilbao from 30 September 2016 until 8 January 2017. Alley considered this to have been a ‘first idea’ for the figure in the left panel of Three Studies for Figures at the Base of a Crucifixion, 1944 (44-01), but a slightly later date is more likely. It is painted on canvas, not fibreboard, and the dialogue between the head and the bowl of flowers is not otherwise present in Bacon’s work until Figure Study I, 1945–46 (46-01); (but see also 44-02). It is significant that Bacon chose one of the Three Studies for Figures at the Base of a Crucifixion to rework at a larger size, and on canvas, for he appears to have been experimenting with a more painterly expression than in his Picasso-esque biomorphs. The shuttered ground in Study for a Figure is painted in eau-de-nil and buff, but show-through in the pigmentation at many points confirms that it was originally painted cadmium orange, like the Three Studies. The painting remained in Bacon’s studio until 1951, and it is possible, therefore, that the curtains were added later than 1945. Study for a Figure is in many respects an advance on Three Studies. The figure’s body, hair and the roses are all virtuoso performances in colour and texture. In concentrating on the substance and expressive qualities of paint, Bacon is turning his attention away from Picasso and towards Rembrandt and Velázquez. This was the last of Bacon’s paintings to be documented by Ronald Alley. In a photograph of Bacon taken by Derek Bayes on22 October 1963, the completed centre and left panels are visible. Alley noted that the studies ‘were painted partly from life’. If that is correct, it was possibly the last occasion on which Bacon painted from a live model. In all probability John Deakin’s photographs of Moraes were also used as aides-mémoire. The pointed head and flattened nose in the left panel are quoted from Honoré Daumier’s bronze bust of Baron Joseph de Podenas (c.1833, Musée d’Orsay, Paris), and possibly also his lithographs of Luigi Filippo. Bacon would return to Daumier’s caricatural distortions several times during the next three years. Three Studies for Portrait of Henrietta Moraes marked Bacon’s consummation of the small triptych format that he had initiated with Study for Three Heads, 1962 (62-07) and which he continued to utilise until 1983. The restricted palette of mainly crimson and white on a textured black ground is masterly, as are the energy and motion of the brushstrokes and smearing of the wet pigment. Indeed Bacon’s execution has a power, skill and confidence that he scarcely ever surpassed in this format. Bacon’s images of extreme situations often seem to be subjects he might have dreamed of, but if that is the case the dream he painted here must have been triggered by consulting Muybridge, a pictorial source acknowledged in the title. It amalgamates the paralytic child he had painted in 1961 (see 61-04) with and an image suggested by Muybridge’s sequence ‘Woman Throwing a Basin of Water’, extensively modified by Bacon into the contorted stooping pose she has been obliged to adopt on the rail. Against a ground of stridently clashing red, orange and violet, the circular rail is exceptionally prominent, emphasising the circular motion of the two protagonists in their pointless, interminable activities. The flat planes of colour intensify Bacon’s portrayal of nihilistic exasperation, expressed in the furious painting of the deformed figures. Deleuze read the figures as a mother and child, which if correct would raise the possibility that Bacon identified with the child.